On 11 December 2014, the 193 member United Nations General Assembly approved, with a record consensus of 177 co-sponsoring countries, a resolution to establish 21 June as International Day of Yoga. Yoga is a priceless gift of ancient Indian tradition. Thousands of years ago Indian saints tried to find out the link between the physical and spiritual world which resulted in the realisation of a holistic science which they called “Yog”. Derived from Sanskrit root “Yuj” meaning “to join” or “to unite”, Yoga is a spiritual discipline which focuses on bringing harmony between mind and body. The practice of Yoga leads to union of individual consciousness with the universal consciousness. Through the systematic practice of yoga techniques balance of body, mind, consciousness and soul are developed. The aim of practising Yoga is to overcome all kinds of sufferings or ailments and achieving holistic health, happiness and harmony. Yoga has the ability to change our perspective of life. Its unifying power leads to completeness and oneness with the world and nature. 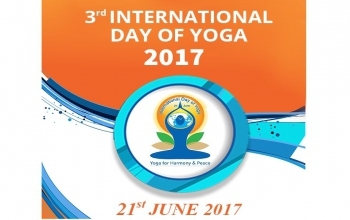 This year marks the celebrations of the 3rd International Day of Yoga. The Embassy of India, in association with Yoga Federation Slovenia, Yoga Alliance Slovenia and ISHA Foundation will be organising an event on 17 June 2017 at 930 hrs at Pasja raven,Tivoli Park, Ljubljana.